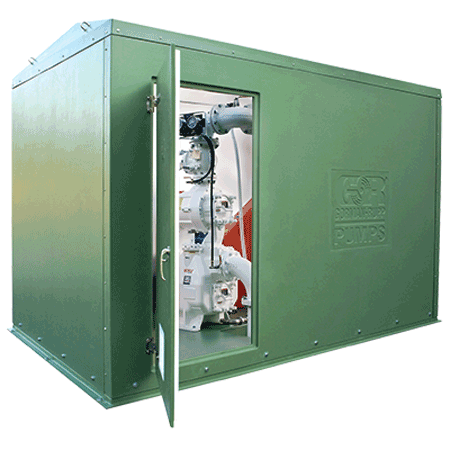 Designed to accommodate the pump configuration and sophisticated controls you need for your pumping requirements. An affordable alternative to modular enclosures, the ReliaSource® 8x12 Above-Ground Lift Station is robust enough to accommodate duplex and triplex pump configurations. The design also features interior walls to house more sophisticated controls than smaller models. As the original ReliaSource packaged pumping system, we developed this fully customizable, NFPA 820-compliant lift station with input from the distributors who know your needs the best. As a result, it gives you the flexibility to meet your heavy solids-handling requirements, along with the convenience, quality and long-lasting performance that define the ReliaSource brand. Like all ReliaSource lift stations, the 8x12 model is a complete system, ready for immediate installation, and guaranteed to meet your sewage pumping needs for decades to come.